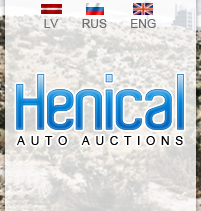 HenicalAutoAuctions in cooperation with the largest vehicle auction organizers in the North America offers special and unique service in the Baltic States - a chance to participate in an online vehicle auction. Using the HenicalAutoAuctions patented auction platform, you can simply watch ongoing vehicle auctions in the Website and also participate in an auction with our brokerage, while simultaneously tracking your participation in the auction. In the auction are involved all major North American vehicle insurance companies, including financial companies, banks, car dealers, fleet and vehicle rental companies. Weekly auctions are always offering more than 100 000 used and/or damaged vehicles - cars, caravans, tractors and machinery, trailers, semi-trailers, quadracycles, motorcycles, snowmobiles, watercraft and boats. Thus, you have the option to choose from a wide assortment of classic, retro and new and modern vehicles. The assortment of vehicles to be auctioned is updated each day, so we're sure you will definitely find your preferred vehicle, be it a retro car, or a powerful motorcycle, or any other land or water vehicle. Participation in the auction is free of charge, so if you failed to purchase the intended vehicle, you can try many times until you will make it. Vehicles to be auctioned are being auctioned in over than 100 auction locations throughout the territory of North America, so you can be sure that your bought vehicle will be delivered directly from the US. More than a million vehicles are auctioned each year, and we hope that with our brokerage you will materialize your wishes and will purchase the vehicle you want at a very attractive price. We also provide delivery of the vehicles to any location of your choice, as well as we carry out the individual conformity assessment full cycle for all vehicles in accordance with requirements of the EU Directive 2007/46/EU, the so-called Certification, and issue Certificates of Conformity for the vehicle permanent registration at the State Joint Stock Company "Road Traffic Safety Directorate" or in the respective registers of other EU countries. By purchasing a vehicle with our brokerage, a full range of services will be provided for you, starting with the purchase of the vehicle in an auction and ending with the arrangement of formalities required for its permanent registration. We also provide consultations on issues related to the purchase of vehicles, their delivery and registration, as well as we are consulting on issues related with customs. We hope that you will use our Website simply to watch the auctions and for active participation in them. We are convinced that you will be interested in some of the vehicles offered at auction, so feel free to contact our staff, and we will help you to acquire the intended vehicle at a very attractive price. Choosing our services, you will make the right choice.